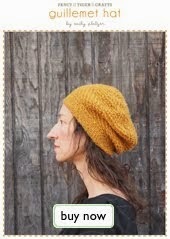 Colette is a darling crafter who is always working on projects of all different sorts. Her gerbil also likes to craft a cozy home out of local alpaca fiber, so she is a regular in our wool and fiber room. 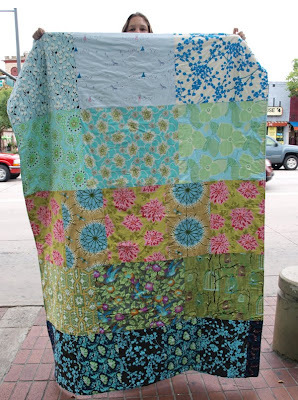 She recently stopped by with an adorable quilt made from her collection of fat quarters. I sew, knit, paint, grow stuff, and hang out with my cat and gerbil (who is a huge fan of Fancy Tiger's llama & alpaca hair). I'm crafty because it's how I've always been. I enjoy making stuff instead of buying it. 2) Tell us about the quilt you've made. No pattern, I just organized the colors of the fat quarters. I like quilting because it creates something people really like to use and it can be either something super simple or more involved and interesting just based on how you want the project to be. Most sewing I learned from my Aunt Sally, a fabulous seamstress and costumer in Chicago, and from trial and error and figuring it out on my own. Penguins, gerbils, hamsters, cats, turtles, squirrels and various marsupials. I like animals. 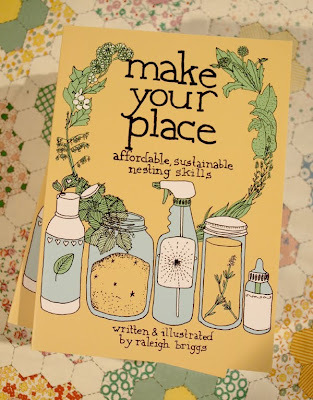 We just received Make Your Place, an adorable book that will teach you the skills for a naturally clean and happy home and an abundant garden. Raleigh Briggs shares her knowledge of traditional and sustainable domestic skills in this endearing handwritten book. 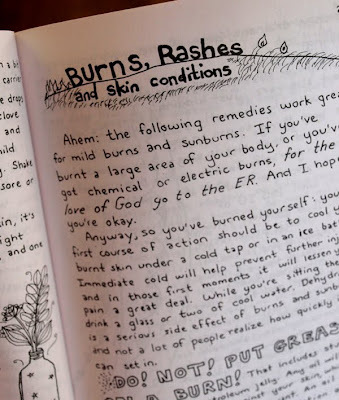 This handbook is great to have around--you can learn everything from making your own natural skin care products to composting to making your own herbal first aid kit. Also, Raleigh is a hilarious writer and makes us laugh. 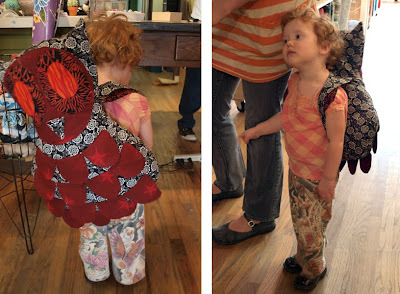 Gina and Minerva visited us in Fancy Tiger and brought along "Prudence", Minerva's new backpack/pillow/owl. So adorable! Minerva was pretty proud of her mom, Gina's handiwork. What cute ladies! Sustainability and fun. I got most of a degree in apparel design a long time ago and I think making things is a healthy and exemplary way to spend time. I spin wool on my spinning wheel, knit, crochet, quilt, dye, whatever strikes my fancy. 2) Tell us about this adorable portable owl pillow. This is Prudence, the owl pillow from the Henry and Prudence pattern by Valori Wells. I sewed it. I leaned to sew when I was seven years old. I had an aunt who tried to teach me, then I taught myself, my own way. Every woman in my family before me sewed out of necessity...I love my grandma's quilts more than anything. My 12 year old cat, Moz. Thanks Gina and Minerva! Happy crafting! Brand new and super sweet--Hot Type iron-on fabric transfers. 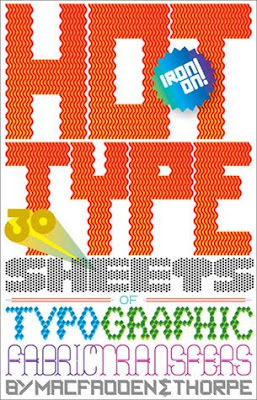 This little book is full of sweet alphabets for you to cut up and iron-on to t-shirts, tote bags, jackets and more. It also includes some pre-constructed phrases to get you started. Now you can finally make that Super Duper shirt of your dreams! I finally finished my elven invisibility cloak! 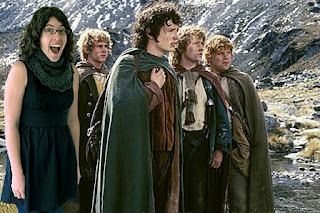 Every time I put it on I am magically transported to Middle Earth with my hobbit friends. What makes a lace shawl an elven invisibility cloak? Gotland! Gotland sheep are the lustrous sheep originally from Sweden whose wool is exclusively used to make the Elven invisibility cloaks featured in the Lord of the Rings films. I purchased my Gotland yarn at the Estes Park Wool festival from the breeders of the first Gotland herd in the United States. 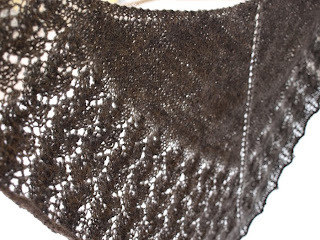 The pattern I used is the Ishbel lace shawl pattern by Ysolda Teague and it turned out great! Now I too, can possess the magic power of the Elves! 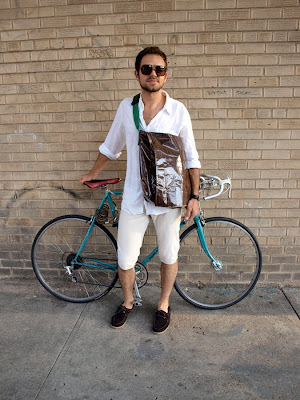 Cade just finished sewing the most awesome woodgrain oilcloth messenger bag. It is the woodgrainiest and we love it! I rework old vintage jewelry into new cool pieces. I figure I have to dress the part of someone who loves things you cannot buy...you just have to make it. 2) Tell us about your sweet bag. I have had the idea for a wood grain oilcloth bag for a while. I used oil cloth for protection against weather and a similar wood grain print for the lining. The strap is a karate belt and I found the patch in an old dresser. I didn't use much of a pattern. I taught myself to sew when I was a kid. I always liked making costumes, so it was a process of trial and error. There are still a lot of errors. New! Cloud 9 Organic Fabrics! 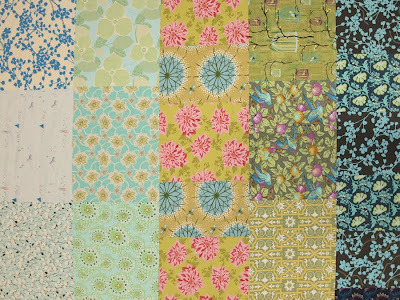 We just received a brand new line of organic cotton print fabrics from the brand new and adorable company Cloud 9 Fabrics. 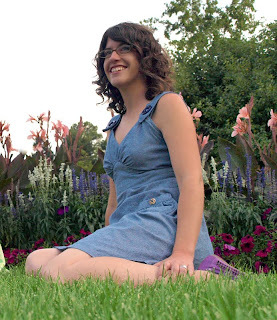 Cloud 9 is co-founded and designed by Etsy superstar Michelle Engel Bencsko of Cicada Studios. The fabrics are 100% certified organic cotton and are printed with earth-friendly dyes. We love the cute modern prints and soft palette! 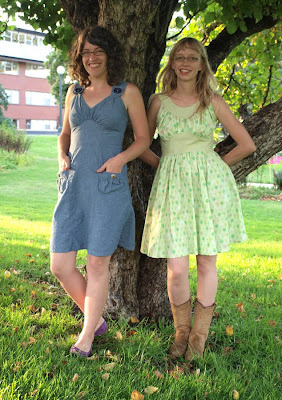 Jaime and I both just finished sewing our Colette dresses. They turned out great and we love our cute new frocks! Jaime made the Parfait pattern out of a soft chambray and added contrasting hand-stitched buttons by Pin Pals to the pockets and large Twinkle buttons for the straps. I made the Chantilly Dress using an Erin McMorris tree print and some coordinating organic cotton canvas in the palest of pistachio. We were so excited to finish sewing them that we went for a frolic in the flower garden and celebrated with some Stevie-Nicks-style spinning. Frankie is one of our regular customers. She is adorable with a capital A and, I think, a future sewing superstar. 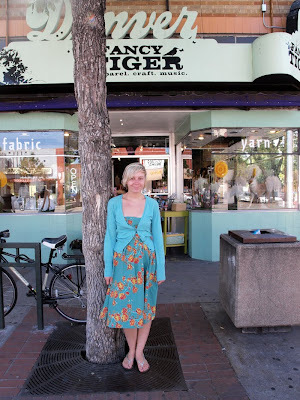 She came in recently wearing an Anna Maria Horner print dress she made. She also told us about a similar one she made for her sister, on which she hand-painted a mountain scene border around the bottom. We were dying to see that dress after she told us about it, so Frankie and her sister came back into Fancy Tiger to show us--both of them looking super lovely! 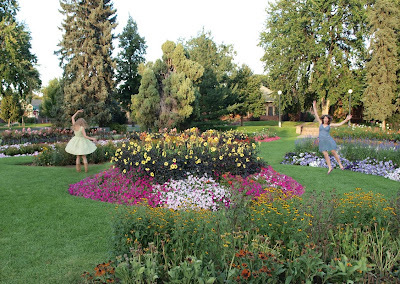 I go to Denver School of the Arts and I am a creative writer. I love looking at fabric and imagining outfits & designs. My school and all the crafty people I meet inspire me. Especially this store. I mostly just sew, I also collage, print and write, though. 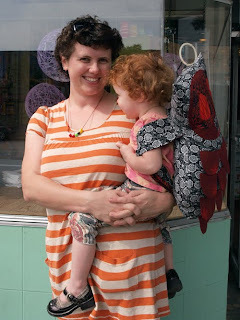 2) Tell us about the dress you made. I made a strapless dress. I used a pattern from Joanne's I used material from Fancy Tiger and a 14" zipper. I made the dress a little longer and more flowy than the pattern to fit the fabric. i also add a brooch to the front to add a new look. I just started last summer. I took classes at Fancy Tiger that got me really interested. My grandmother used to sew and she taght me and has helped me with all my projects. 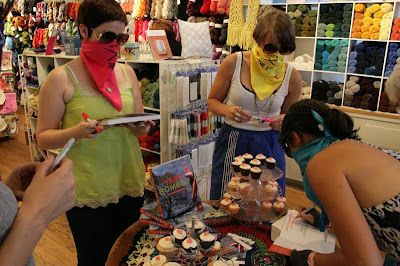 Yarn Bombing Book Release Party Fun! 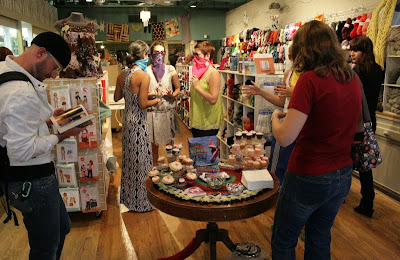 We had tons of fun times on Friday night at the Yarn Bombing book release party. 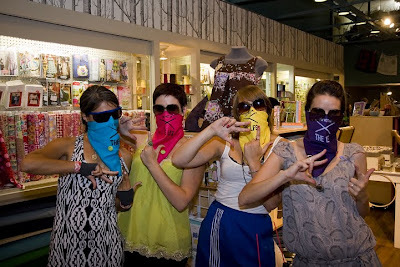 The ladies of the Ladies Fancywork Society came out with homeade cupcakes and secret prizes, like crocheted book cozies and screen printed bandannas. The Yarn Bombing book was so well received that we sold out of copies in no time! Thanks, LFS ladies, and everyone who came out to share in the fun times! Thanks to Steven Wallace and Suzan Platzer for photos of the event! New! 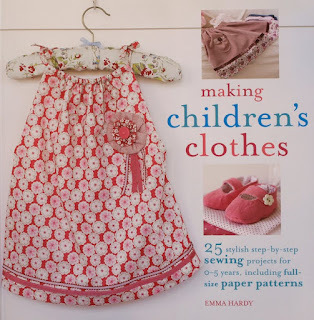 Two New Books for Crafting Kids Clothes! 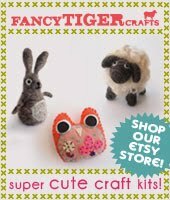 We just receive two new books to get you crafting up cute clothes for kids of all ages. 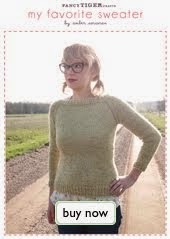 Easy Kids Knits for knitting and Making Children's Clothes for sewing. 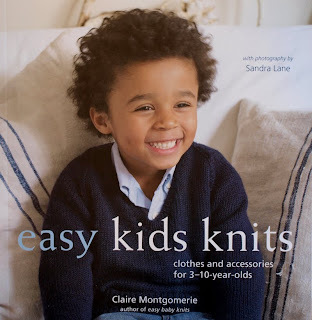 Easy Kids Knits has great knitting patterns for kids 3 - 10 years. The clothing patterns are classic and cute and perfect for knitting for the elementary-school-crowd, for whom it can be hard to find cute patterns. 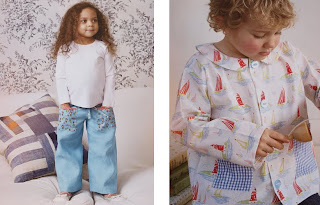 Making Children's Clothes includes patterns for modern kids 0 - 5. 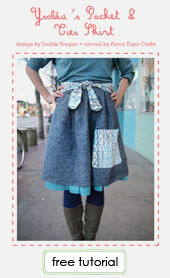 The photos are adorable and inspiring and the garments feature some of our favorite cute fabrics! Cuteness!! It's time to start crafting for your favorite younguns! 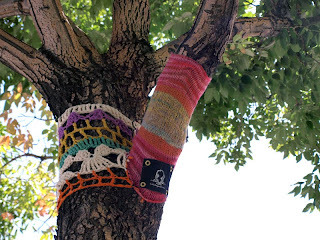 The trees that line our shop on South Broadway are now the cutest trees ever thanks to Yarn Bombing! What is Yarn Bombing? 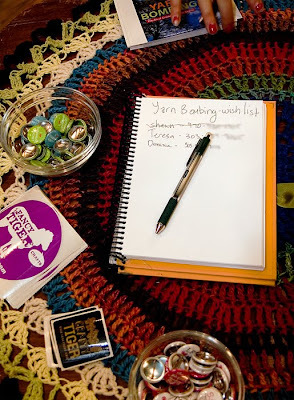 That question can be answered if you want to come to Fancy Tiger Crafts tonight for our book release party for Yarn Bombing: the art of Crochet and Knit Graffiti. 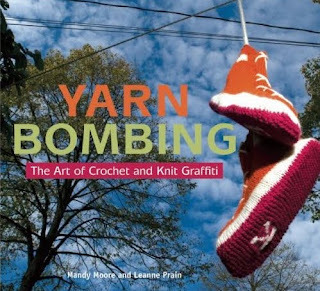 Yarn Bombing is a fabulous book that interviews and chronicles yarn graffiti groups from around the world as well as gives patterns and ideas for your own subversive crochet or knitting. 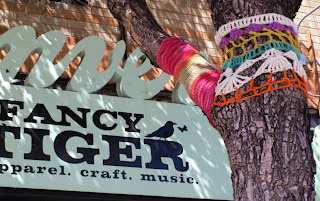 Yarn Bombing features Denver's own Ladies Fancywork Society and the Ladies will be at the event signing books and answering your questions. Please join us tonight from 7 - 9pm for drinks and fun times with the Ladies Fancywork Society and Yarn Bombing! 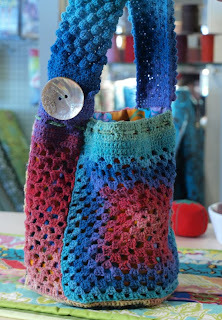 Megan recently came into Fancy Tiger Crafts and blew our minds with her amazing crocheted handbag. We had never seen anyone crochet with Noro sock yarn and the results were super adorable. 1) What crafts do you like to do? I sew, crochet, knit, collage, basically create clothes and accessories with any material & get inspiration from the movies I watch while completing my project. 2) Tell us about your cute bag. I crocheted this purse out of Noro Kureyon sock yarn and scraps I had laying around and created the pattern on my own. 3) How did you learn your craft? My mom taught me to crochet (and sew) when I was five. She's artsy and crafty but denies being any good at her arts. Rhinoceroses, hippos, elephants and manatees. Big, fat animals.